April 12, 2019: Guess what, now! The Android Pie is NOT COMING to Galaxy S7. That was a false alert (the April 11 update below). It’s wouldn’t have looked good even on April Fools day, but on April 11, it totally sucked! 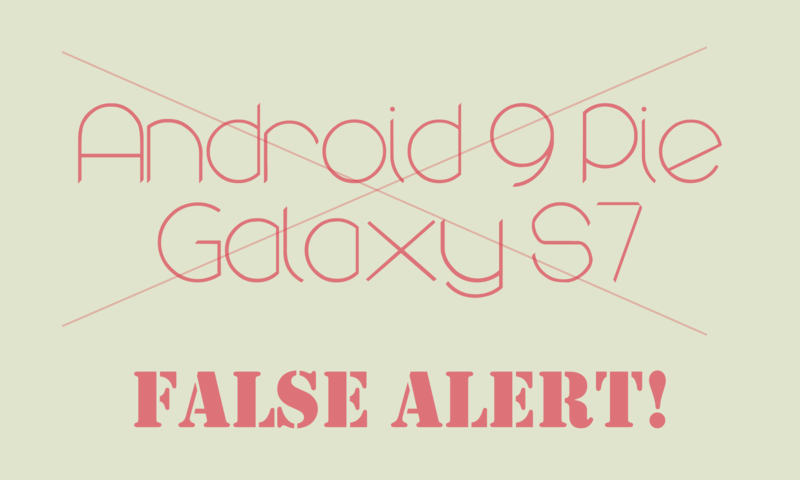 April 11, 2019: Against all odds imaginable Samsung looks to have decided in favor of Galaxy S7 and Galaxy S7 Edge with regard to Android 9 Pie update. Yes, the One UI topping update might be headed toward the users of Samsung S7 and S7 Edge soon. 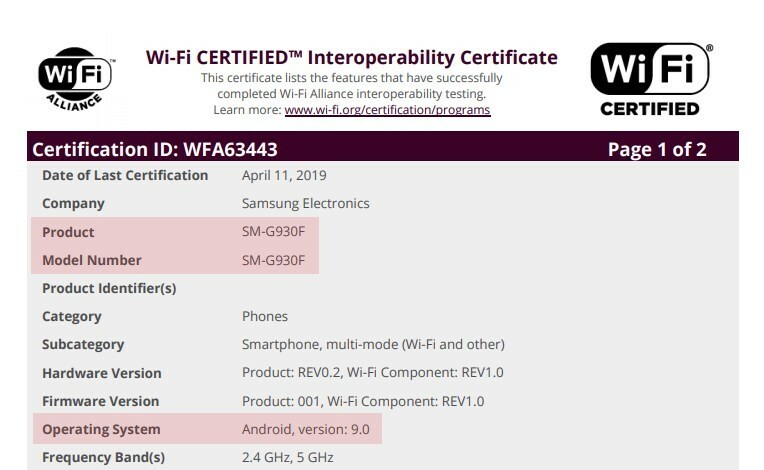 Well, Samsung announced Android Pie support for S7 handsets yet, but we know this because of the Wi-Fi Alliance, a global certification authority that clears smartphones and all types of gadgets to conform with Wi-Fi standards, just certified Android 9.0 for Galaxy S7 (S7 Edge certification should be around the corner). Read more about Galaxy S7 Android 9 certification by Wi-Fi alliance here. Here’s a screenshot of S7 model SM-G930F getting certified at WiFi Alliance. 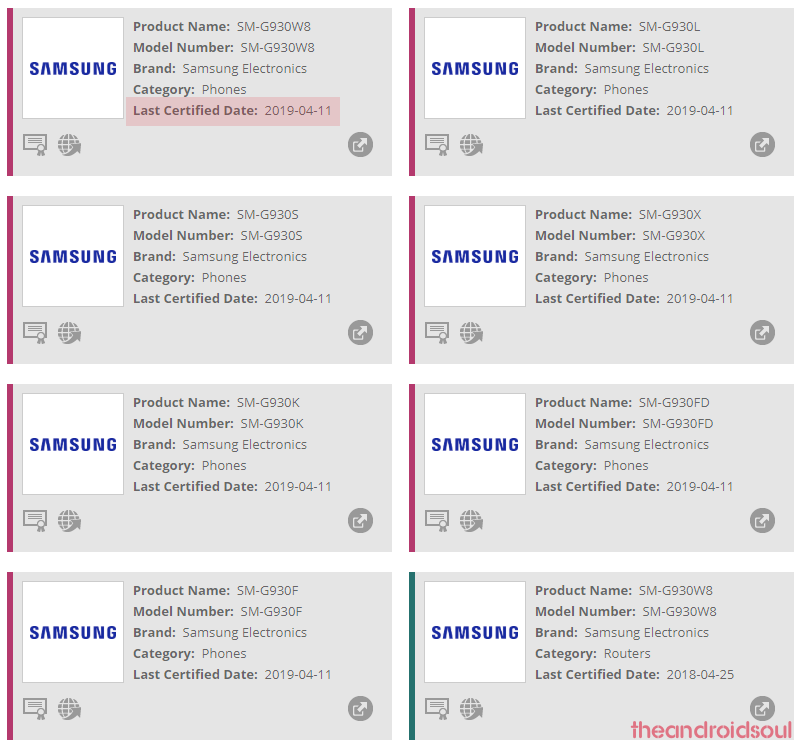 Here is a list of all the variants of the Galaxy S7 that were certified for Android 9 Pie today at Wi-Fi Alliance. S7 Edge users, don’t fret about not seeing our device up there in the screenshot. Every major and minor update have been released at the same time for both the S7 and S7 Edge, and this should be no different a major update like Android 9 Pie. The S7 Edge should be getting certified at pretty soon too. 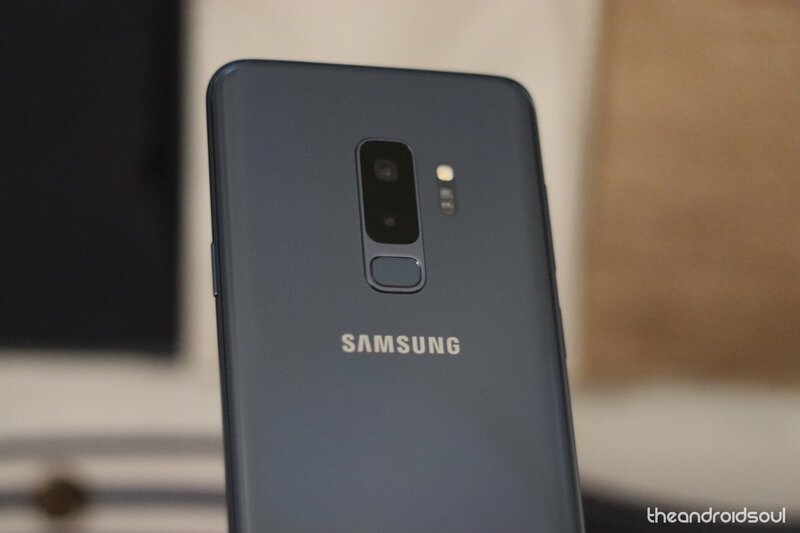 April 11, 2019: Samsung began rolling out Android 9 Pie update with One UI for the Galaxy J6 and Galaxy Tab S4 earlier today. The Pie update is available for the two variants of the Galaxy J6, SM-J600F and SM-J600G. For the Tab S4, it’s the model no. SM-T835 that is receiving Pie, starting with France. 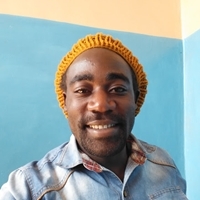 March 26, 2019: Android 9 Pie is available for the Galaxy J8 as version J810FPUU3BSD1. The update includes the Samsung One UI and April 2019 security patch, but so far, it has only been spotted in Russia. Samsung is the leading smartphone vendor in the world and as always, it is the South Korean company’s actions that will determine how fast the new Android 9 Pie update will gather pace. Google already did its part and made the AOSP available beginning August 6, 2018, and now it’s upon Samsung to make it happen. If you own a Samsung Galaxy smartphone or tablet, this page has all details about Samsung Android 9 Pie update, what and when to expect it, the devices that will receive the OS and even more details on unofficial Pie updates via popular custom ROMs. Following weeks of testing, Samsung finally released the first stable version of Android 9 Pie with One UI on top for Galaxy S9 and S9+ on December 24, 2018. The first carrier variant in the U.S. got the Pie update on January 29, 2019, and a day or so later the OS arrived on multiple carriers, including Verizon Wireless, Sprint, and AT&T. Samsung released the first stable update to Android 9 Pie for the Galaxy S8 and S8+ in Europe on February 19, 2019. Those in the U.S. started getting the update towards the end of March 2019. Like with the case of Oreo, it will take some time before the Pie update arrives on the Galaxy S8 Active, which could see this handset joining the party in April or even May 2019. The update to Android 9 Pie will be the second and last major OS upgrade for the S8 series. Samsung usually rolls out two major OS upgrades to its flagship phones in the S series. With the update to Oreo, the Galaxy S7, S7 Edge and S7 Active were receiving their second and last major OS upgrade, meaning they won’t be getting any official update to Pie. But wait, then Samsung got the S7 certified for Android 9 at Wi-Fi Alliance. Which means that both the S7 and S7 Edge will be receiving Android Pie, officially, and pretty soon. Samsung released the stable version of its Android Pie update for Note 9 in Europe on the fourth day of 2019. Identified as software version N960FXXU2CRLT, or CRLT in short, the update first rolled out in Germany and later on found its way to other parts of the world that use the N960F variant. Those in the U.S. had to wait until the final day of January 2019, with AT&T and Sprint leading the race, but it took T-Mobile, U.S. Cellular and Verizon Wireless until March to release the update. Samsung has released the stable version of Android 9 Pie for the international Galaxy Note 8 with model number SM-N950F as well as U.S. variant with number SM-N950U. Unlike the device it takes after, the Galaxy Note 7, the Note FE came preinstalled with Android 7.1 Nougat out of the box and has since been upgraded to Android 8.0 Oreo, the first major OS upgrade. The second major OS update to Android Pie came on March 25, 2019. The Galaxy A9 2018 received Android Pie on March 13, 2019, in Europe. The other two Galaxy A9 variants, the A9 Star and A9 Star Lite, should also get the nod somewhere in Q2 2019. As for the 2016 duo of Galaxy A9 and A9 Pro, there won’t be an upgrade to Pie, unless the Android development community comes up with something for you. As of March 12, 2019, users of the Galaxy A8 and Galaxy A8+ 2018 can install Android 9 Pie on their devices. The update is coming to the A8 Star this March. The A8 2018’s nearest predecessor, the Galaxy A8 2016, was launched with Android Marshmallow and got updated to Oreo, the second and last major OS upgrade. 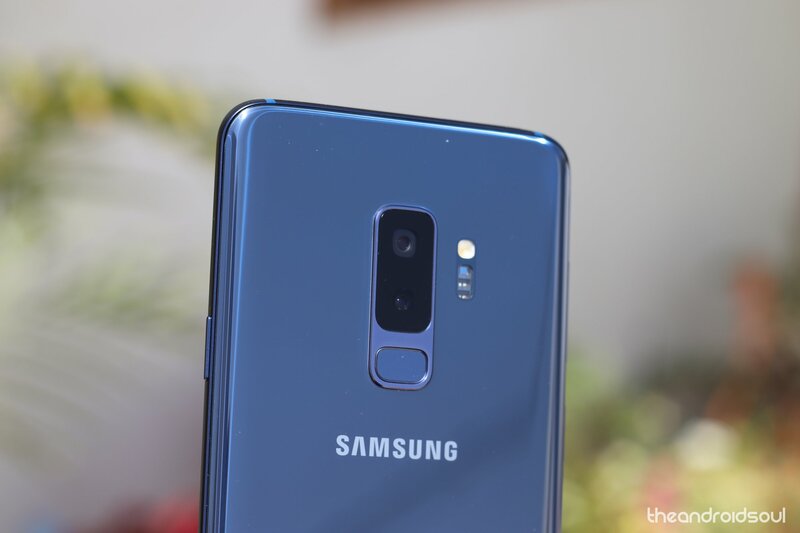 Samsung Galaxy A7 2018 is the only device in the Galaxy A7 family that was guaranteed an update to Android 9 Pie and indeed, the rollout started out in Europe on March 14, 2019. The rollout started with model SM-A750FN and should spread out to models SM-A750F and SM-A750GN in March/April 2019. Unexpectedly, the A7 2017 was spotted on Geekbench with Android 9 Pie prompting suggestions that it might be up for a third major OS upgrade, but this is easily a custom ROM. The device comes preinstalled with Android Marshmallow and got an update to Oreo in Q3 2018, the second and last major OS upgrade. Samsung has begun rolling out Android 9 Pie for the A6 and A6 plus handsets. The One UI update is rolling out for the two devices in the UAE only right now but we thinkit will expand to more markets pretty soon. Samsung hasn’t released any Galaxy A5 handset in 2018. The last of this kind to come around was the Galaxy A5 2017 and so far, the device has received two major OS upgrades, the latest of them, Android 8.0 Oreo, having rolled out in Q2 2018. With that said, the only other way you can get Android 9 Pie on your Galaxy A5 2017 handset is if a Pie-based custom ROM will be made available, which we can’t tell for now. You can keep an eye on these pages for such news, though. Like the Galaxy A5, Samsung hasn’t refreshed the Galaxy A3 series. The outgoing Galaxy A3 2017 has received two major OS upgrades, including being the first to get Oreo with respect to the Galaxy A 2017 family of devices. With this in mind, don’t look forward to an update to Android 9 Pie officially, but maybe something could come up unofficially. If it does, we’ll update any of the pages below, so make a point of keeping an eye on them. The Galaxy J8 has a ready update to Android 9 Pie in Russia as of April 08, 2019. The update, besides installing Pie, also brings Samsung One UI on top of stock Android. The J8 is the first in the J series to get a taste of Pie. It’s only in Q3 2018 that Samsung started rolling out Android Oreo to the Galaxy J7 2017 family, the first OS upgrade. Lately, Galaxy J7 handsets have been receiving two major OS upgrades and apparently, the story will be the same for the Galaxy J7 Pro, whose update is slated for June or July 2019. The 2017 J7 edition will also be joined on the Pie bandwagon by the Galaxy J7 Duo and Galaxy J7 Neo, both of which will receive a slice of Pie in July 2019 as well. Update [April 11, 2019]: Android Pie for Galaxy J6 is now available. Models SM-J600F and SM-J600G are the first ones to get Pie. The update should be available for J6+ too in the near future. Samsung hasn’t announced refreshed versions of the Galaxy J5 family. The last to come around was the Galaxy J5 2017 and none from the edition will be upgraded to Android 9 Pie. Since the Galaxy J5 2017 series has Nougat out of the box and is entitled to one major OS upgrade, the best devices in this series can do is Android Oreo, which is already rolling out. If Samsung unveils the Galaxy J5 2018, it will be preinstalled with Android Oreo and hence eligible for an update to Android 9 Pie, but until then, no J5 handset will be receiving the new OS. Both Samsung Galaxy J4 and J4+ are eligible for Android 9 Pie updates. This is because the two have Oreo preinstalled and since they are eligible for a single OS upgrade during their lifetime, they are guaranteed to receive Android Pie. According to Samsung, the J4 and J4+ will get Pie in April 2019, but reports from Turkey suggest the rollout could begin a little earlier on March 29, 2019. Well just have to wait and see! None of the Galaxy J3 handsets from 2017 will be updated to Android 9 Pie. However, all Galaxy J3 2018 variants that come preinstalled with Android Oreo are guaranteed to receive an update to Android Pie. Being the budget device it is, owners of eligible Galaxy J3 handsets can expect to receive Pie somewhere in Q3 2019, which is a really long wait. Samsung’s first Android Go device is expected to get an update to Android 9 Pie Go Edition and so does the Galaxy J2 2018. Samsung says the duo will switch to Pie this April 2019, but it remains to be seen whether the company will live up to its promise. As for the other Galaxy J2 variants, no Pie update is expected officially. Update [April 11, 2019]: As expected, Samsung has begun rolling out Android Pie update with One UI skin for the Tab S4 tablet. Available only in France right now, the Android 9 update should be hitting more regions across the globe soon. Samsung Galaxy Tab S3 will be receiving its second and last major OS upgrade to Android 9 Pie with One UI in August 2019, this is according to the most up-to-date plans the company recently published. Both the Galaxy Tab A 2017 and Galaxy Tab A 10.5 (2018) are eligible for an update to Android 9 Pie. 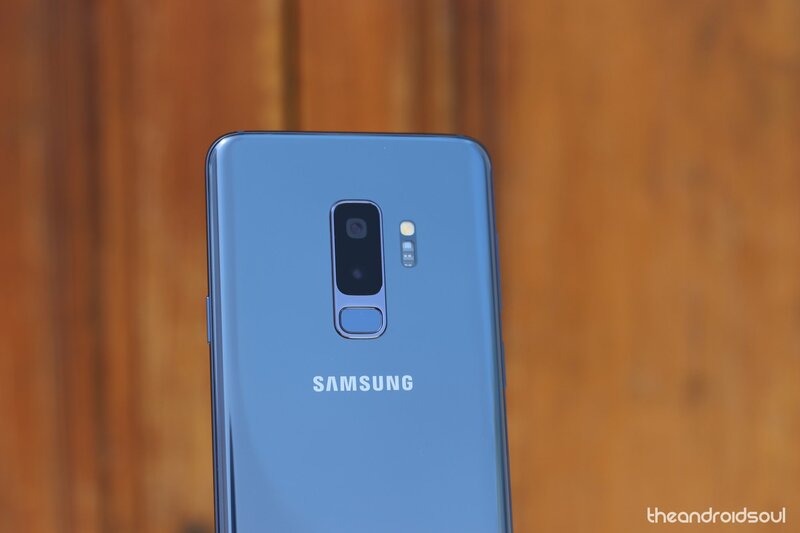 According to Samsung, though, the former will get the nod in September followed by the latter in October 2019. Which Samsung Galaxy device do you own? Does it appear on this list? Let us know in your comments below.